Time to dial back anti-air. Season 2 is almost over and as we approach the Capcom Cup and the inevitable introduction of new characters, it’s a good time to consider what changes could be on the horizon for Street Fighter V. Going into individual characters tweaks would, of course, take forever, so instead let's concentrate on the three major changes that would be welcome in the next version of Street Fighter V.
Street Fighter V is a game built around risks and reads. If you correctly read your opponent, or take a risk that pays off, you can do significant damage with relative ease as your reward for getting it right. On the other hand, getting it wrong will leave you open to getting punished—sometimes Crush Countered—and being on the receiving end of some considerable hurt. Ryu’s Dragon Punch is this principle condensed into one move. Correctly anticipate your opponent’s next move and you can blast them with one. Get it wrong, and you’ll sail right past them and they can Crush Counter you as you land, which is the start of the game’s most devastating combos. However, why would you even bother taking such an anti-air risk, if you can just press LP and stuff their attempt to jump in on you? Yes, quite a few characters have the ability to jab you out of a jump-in attempt in SFV, and quite a few of these characters have a Dragon Punch. Only one of these will leave you extremely vulnerable if you mess it up, and it’s the one that has the least amount of execution, too. It goes against the core messaging spoken about Street Fighter V during the run up to its release— that this would be a game where you really had to commit to each attack. There’s literally no reason to use the iconic anti-air Ryu has been packing for years outside of combos. Necalli has one of the nastiest anti-air jabs, as he also has a command grab, meaning that if you jump at him and he jabs you out of the air, he gets a free three way mixup. Of course, this all means that he doesn’t have to use his higher-risk Raging Light DP, and wouldn’t get the free mixup situation if he did! However, some characters do need them. Zangief and Dhalsim would really struggle without their jab as a means of stuffing jump-ins. So perhaps the answer is this—no character with a Dragon Punch should have a single button anti-air? 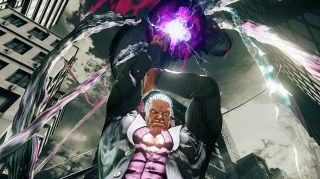 When Urien was released, it was clear that he had an abundance of really interesting tools to take into a fight. He looked tricky and one of the better DLC characters when it came to matchups against the original roster. However, he was balanced by a lack of a cross-up attack and no three frame jab—two things that give other characters a way of starting offense. Let’s take a second to look at Necalli’s means of approach. He’s got the aforementioned cross-up and three frame jab, which also acts as an anti-air. He has a Dragon Punch, he has a charge move that negate projectiles and he has a command grab. He has a dive kick, that will change his trajectory in the air. He has three crush counter buttons. He has an invincible reversal on wakeup, so he can get rid of pressure. He has a decent V-Reversal, a V-Skill that he can use for zoning and a V-Trigger that turns him into an even better version of himself. He has everything. Does that seem a bit daft to you? I think taking away a few means of approach as a way of balancing a character who has a few extremely strong options, but to then give one character all of them? Chun-Li also has a massive amount of tools, more than most of the roster, and the fact she lacks a command grab or Dragon Punch is negated by the fact that the rest of the things she can do are ridiculously strong. It’s going to be really interesting to see what Capcom have planned in terms of character nerfs, but Necalli and Chun-Li are going to need some real work… or will they bring everyone else up to speed? Find more of our Street Fighter V coverage right here. Okay, it’s 6.5 frames now, but the built-in input lag in Street Fighter V has been an issue with competitive players since it was discovered. Essentially, when you press a button in Street Fighter V, eight frames pass by before the input registers, although this was recently reduced to 6.5 frames in one of the more recent patches. Here’s an example of how that affects the game. Nash’s dash animation has no visual tell for the first eight frames, meaning it is literally impossible to react to it, only guess when it is coming. Dropping it shows that Capcom are likely planning on pushing it down to something resembling Ultra Street Fighter IV in future (4 frames of lag) but right now, it’s still a problem. It's worth mentioning that for me personally, it’s not even something I notice. I’m not at a level where milliseconds of lag is going to make up for the fact that I just botched Dhalsim’s teleport for the millionth bloody time. I recently spoke to Ryan Hart and Darryl ‘Snake Eyez’ Lewis at the recent UK Premier event at EGX, however, and the first thing both said was that the one thing they’d change about the game is the input lag. Street Fighter IV went under many changes before Ultra was released. Remember Sagat in vanilla SFIV, who may as well have been carrying a shotgun given how effective he was? A good update patch can actually give a game a real new lease of life, and SFV—now we’ve got a year’s worth of competitive and casual data to see—could really benefit from one as it moves forward into 2017.